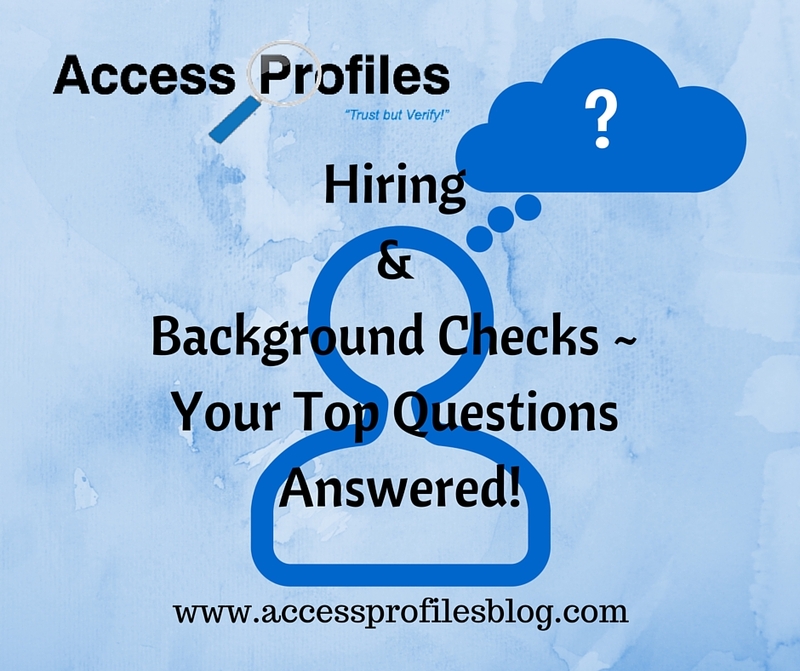 Hiring & Background Checks ~ Your Top Questions Answered! There is no doubt about it. Background Checks can be confusing. Understanding why you need to use them, what they entail, and who you should run them on can have your head in a spin. Instead, you need to think of Background Checks as simply another business tool. And utilizing this tool is a sound way to elevate your hiring practices and benefit your small business. I have challenged myself to help you begin that process. Announcing….. “Frequently Asked Questions & Resources”! We have created a website Page dedicated to answering Your Questions about Background Checks! Our goal its to eliminate the mystery and confusion about how using Background Checks can help your Small Business. What Exactly IS a Background Check? Why Do I Need them In My Small Business? 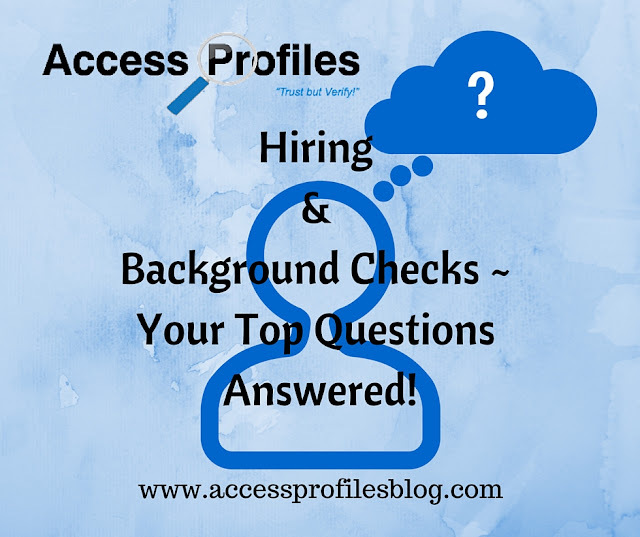 How to Pick the Right Background Check Company for You? We will also include resources to help you stay compliant and protect Your Small Business. These will include topics like tips on creating compliant background check release forms and the steps you need to take to ensure your applicants know their rights when it comes to employment screening. This page will continue to be a work in progress. As new questions or hiring guidelines arise, we will add them to the list. And if you have specific questions or concerns, we want to hear about them! You can Contact Us directly from our site or email us through the link provided. Not only will we respond to you directly, but we will include the question and answer on our page to help everyone who may have the same concern. Creating this interactive resource page is the perfect way for us to help “Pay it Forward”. We hope to help both our clients and readers with their own Small Business Success! Click on “Resources & Frequently Asked Questions” NOW to see what we have started. Help Spread the Word and Please Share this with other businesses you know! Contact Us Now and API can help you with Your Hiring Needs! Discover more About Us and our Hiring, Business Mentoring, and Security Consulting services too! Thanks, and we hope to hear from You! Small Business & Giving Thanks! This is the time of year when many of us take the time to get together and to give thanks. We plan gatherings with family and friends ~ everything from traditional Thanksgiving dinners to quick lunches ~ all in the hopes of connecting and spending quality time. But no matter what we choose, the season inevitably stirs within us feelings of appreciation and thankfulness for all we have and all that we accomplish each and ever day. 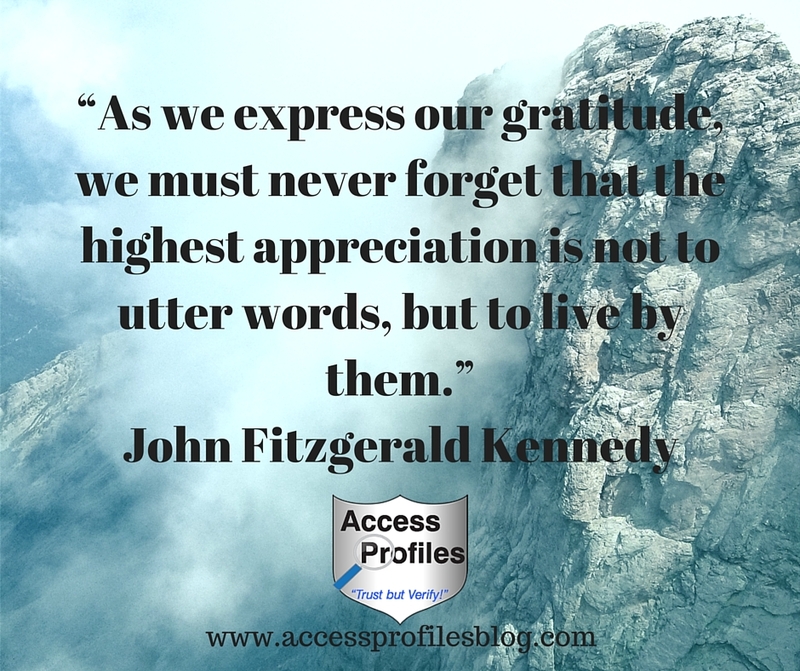 At this time I would like to extend that gratitude to you ~ our clients, readers, and Social Media friends. I feel truly blessed having connected with each of you and I appreciate your constant support. It has truly renewed my commitment to you and to my business. 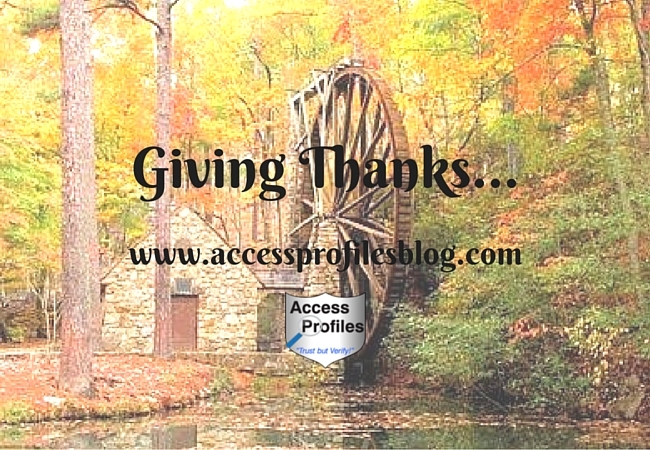 Being Thankful Drives Me to Pay it Forward in My Small Business! "Tweet This"
Most of all, it has given me the drive I need to start and end each day with a clear focus and a sense of purpose. For this I truly Give Thanks! I know that many of you are pursuing your own success. You may even be small business owners yourselves. I am truly thankful for your encouragement as I pursue my own goals, and I am hopeful that you have felt the same encouragement from me. To this end, a large part of my gratitude has evolved into "Paying it Forward" in any way I can. I actively use Social Media in support of others. I share blog articles and posts made by other Small Businesses. And, most importantly, I Shop Small myself! You can find out more about how I use my Small Business to achieve my goal to Pay it Forward HERE! It is also been extremely gratifying to feel the camaraderie and support you each have shared with me. I can honestly say that I feel lucky and privileged. You are all wonderful and amazing people. If you want to help spread my words of gratitude...Please Pay it Forward and Share this article! Thanks! Discover how API can help you succeed in your Small Business. Contact Us Now! Also Check out our About Us, Background Investigation, Business Mentoring, and Security Consulting pages to find out more! 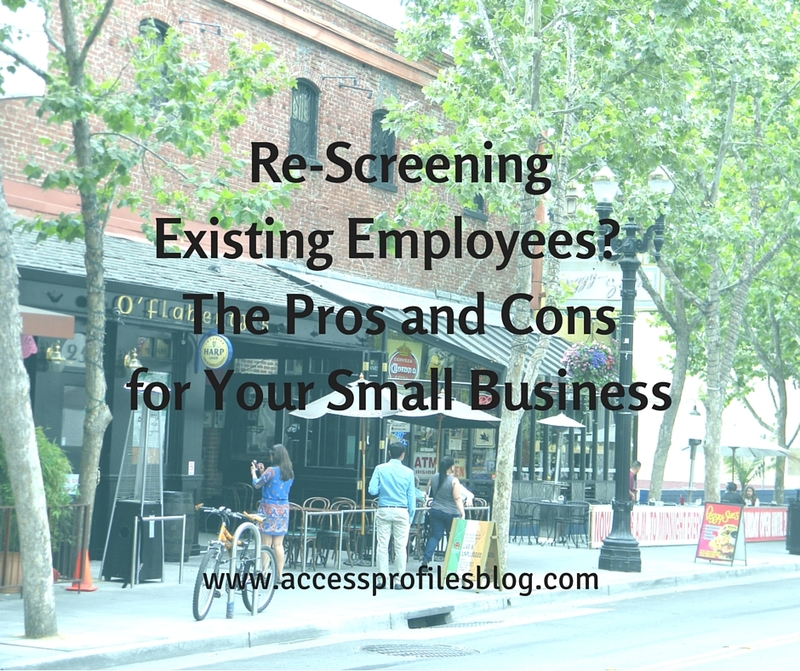 Not Re-Screening Your Employees can Hurt Your Business! As an employer, you understand the benefits of background checks. You recognize that having all the facts before deciding who to hire makes good business sense. And I have written numerous articles detailing why, when, and how to do it right. You can find them here! 4 Reasons Why Small Businesses Need to Do Background Checks and Why Not doing Background Checks is a Big Mistake . is much harder to understand. As a business owner, you may believe that since you checked into your employees history once, there is no need to check again. Or you may think that re-screening them shows a lack of trust. 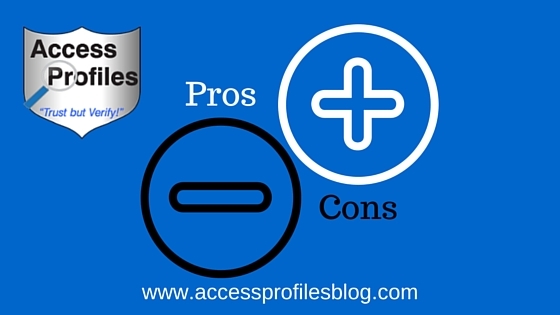 While I can understand the confusion, there are legitimate reasons why doing post-hire screenings make sense. You should first understand one thing ~ Relying solely on your initial employment background checks to mitigate risk can give you a false sense of security. While your employees may have been hired with a clean record, this might not always continue to be the case. Or you may have hired someone knowing they had a criminal past, but be unaware that they have since re-offended. Either way, doing background checks on current employees is an effective way of discovering whether there is new information you need to know to keep your company safe. Existing employees actually pose their own set of risks. They already have access to your company information and assets. They also have contact with your other employees and even your clients. Day in and day out they are acting as the face and voice of your company. But as with anything, there are Pros and Cons to re-screening. It is important that you understand both before making the decision to use post-hire checks in your small business. You can find out more about the “Why” and “When” of re-screening here! For these reasons it is important to ensure that nothing has changed since your employee’s first background check. Questions concerning the costs involved, the potential of raising the ire of the EEOC, and most importantly, the effect re-screening could have on company morale need to be considered. Most re-screening involves checking for any possible new criminal records. The most accurate searches are done directly through the courts ~ and this involves paying any court search fees and, most likely, the fees of a background check company. Additional time is also spent in verifying the information found, along with following all guidelines including obtaining a signed release for the re-screen and all individual assessment practices. Find out more in “Individual Assessments ~ What They Are and Why You Need to Use them in Your Small Business”! As with anything concerning employment background checks, it is important to keep in mind the EEOC, state, and federal guidelines governing these checks. You still need to obtain the required signed releases from your employees permitting the check. You also need to follow all steps outlined in your own hiring policies concerning notice of rights, the individual assessments I discussed previously, and the question of “business necessity”. You also need to be careful to follow a well documented policy describing how you will deal with any new criminal record discovered during the re-screening. Find more details on what you can do to keep compliant with EEOC and state/federal guidelines in “Tips to Help Your Business Fly Under the EEOC Radar”. What you need to know is that despite guidelines on re-screening, the EEOC does permit background checks on existing employees. The key factor is to keep firmly in mind your “business necessity” for doing so. This means that, as the employer, you need to show that your policy to re-screen is directly related to the job the employee is filling and the safety of your company. Once again, this means you need to consider the Nature of the Job (specifically the duties required to fulfill the job) and why certain criminal conduct would hinder successful performance of those job duties. As a result, 100 existing workers were denied re-employment, despite having worked with the company without incident in the past. The EEOC claimed that these actions had a “disparate impact” on minority workers and challenged BMW in court. The court ruled in favor of the EEOC, in the amount of $1.6 million. The ruling was mainly based on 2 factors. None of the employees denied re-employment had exhibited any problems in the past and BMW did not show any “business necessity” in refusing to re-hire them. Being careful to have valid business reasons for re-screening is crucial to not running into a possible lawsuit. As a small business owner, you have the right to be concerned that re-screening may create an atmosphere of distrust in your workplace. You may be worried that it sends a message of distrust between you and your employees. You may even question whether being re-screened before being considered for promotions creates additional stress on your valued employees. While these are valid concerns, your best option is to develop and communicate a sound re-screening strategy that will address these issues while mitigating risk to your small business! In fact, it is in your best interest to develop this policy long before you ever need to use it! Be sure to address when and how any re-screenings will take place. You need to decide whether these re-checks will be regularly scheduled (for example every 2 years) or only in certain situations (for example, when an employee is up for promotion). The number one thing you need to do is to be Open and Honest about your Re-Screening Policy. Your employees will be much more likely to accept and understand the need to re-screen when you clearly communicate why you have made it part of your policy. Anything you can do to put your employees at ease with the entire process should be done. Despite this, you still may encounter negativity concerning re-screening. Any time employees feel their honesty and integrity is being questioned, it can have an impact on the work environment. You must keep communications open between yourself, your manager, and your employees. Be willing to listen to their concerns. But, most importantly, you need to be sure to explain that your main reason is the continued safety of not only your company but also your employees. Be clear on exactly how the re-screen will be done and who will have access to the information obtained. This can go a long way in alleviating any fears and concerns your employees may have. Re-screening your current employees is a sound way to practice your due diligence and to protect your small business. It helps mitigate the risk of retaining an unsafe employee that has contact with your other employees, your clients, and may gain increased access to your company assets and sensitive information. with your Pre and Post Employment Screening Questions! We will help you create a sound policy that addresses your unique needs and your bottom line! Discover More About Us and Our Services ! We can provide Small Business Mentoring and Company Security Consulting too. *Source1:Learn more about the EEOC’s stance on Employment Background Checks here! Do You really know what happens when you apply for a job? While the steps may vary company to company, what is constant is this ~ only one person will eventually be offered the job. Congratulations if you are the one chosen, but if you are not, the question often becomes “Why”? That is when you start to second guess yourself. Did your resume just get tossed? Were your education or experience lacking? Did they even get your resume? And if you are fortunate enough to get as far as a phone interview, you still may not get any notice if the job was filled ~ let alone why you weren’t the one hired. There is no doubt that looking for a job can be demoralizing and confusing. during the hiring process can help. It all starts with your Resume! Before you even apply, it is important that your resume is memorable ~ and for all the right reasons. Employers DO care about not only What is listed but How you list it. Things like poor spelling and grammar can be deal breakers. Missing or Inappropriate Contact Information ~ Have You listed a professional email address? A working contact phone number? Do You have Voicemail? Dates of Employment are Inaccurate or Not Listed ~ Missing dates or ones found to be untruthful are questionable. A “Revolving Door” List of Employments ~ staying at your jobs less than a year (while one or two of these short term employments may not be a problem, a pattern of this is). your resume is “Background Check Ready” before you ever submit it. If it is found out later that you lied about anything listed, your chances of getting the job are unlikely. Find out what steps you should take to get your resume up to par here! After your Resume is ready, the next step is applying for the job you want. Many times this starts with a cover letter. Make sure your cover letter gives clear cut examples of the skills/education you posses that match with the qualifications necessary for the job. Insert keywords directly from the job posting in your cover letter. This is important because many recruiters and human resource personnel immediately weed out applications that do not meet these requirements. And if you are applying online, those keywords are even more important. While you will not have the luxury of a cover letter here, keywords can still be used throughout your application. Remember, your resume is more than just a list or “about you”. It’s focus should be on how you are the answer to the company’s problems and needs. So make sure that your resume clearly shows what you can do to help them. This is probably the most frustrating and anxious time for many job seekers. You can expect to wait anywhere from a few days to a few weeks after you apply (and sometimes even longer!). In many cases (especially when an online application process is used), if you are not going to be offered an interview, you will not hear anything at all. When you apply online, a “real person” may actually never see your application. The company’s system only passes on those resumes that fit their pre-determined parameters. This is why keywords can be so important. Even if you are able to apply with the more “old-fashioned” cover letter and resume, you still may not hear anything from the company. Good business would dictate that if the job has been filled or if you are not being considered, that you receive at least an email to let you know. But this is not always the case and, even worse, you have no control over it. Companies will say that they simply get too many resumes to let each applicant know if the job has been filled. I think that unknowingly, they may be harming their brand. People talk. And a company that is willing to go the extra mile and notify all applicants will be noticed! Get Ready for the Interview! Many times this step can start with a phone interview (or two). Companies look at this as a way to narrow down the applicant pool and save money and time. If they are still interested after this, then a face-to-face interview will be scheduled. This can be a day long affair. You may meet with multiple people on the hiring team all in one day ~ human resources, hiring managers, etc. Other times your initial interview will simply be the first round and you will meet only with one person. 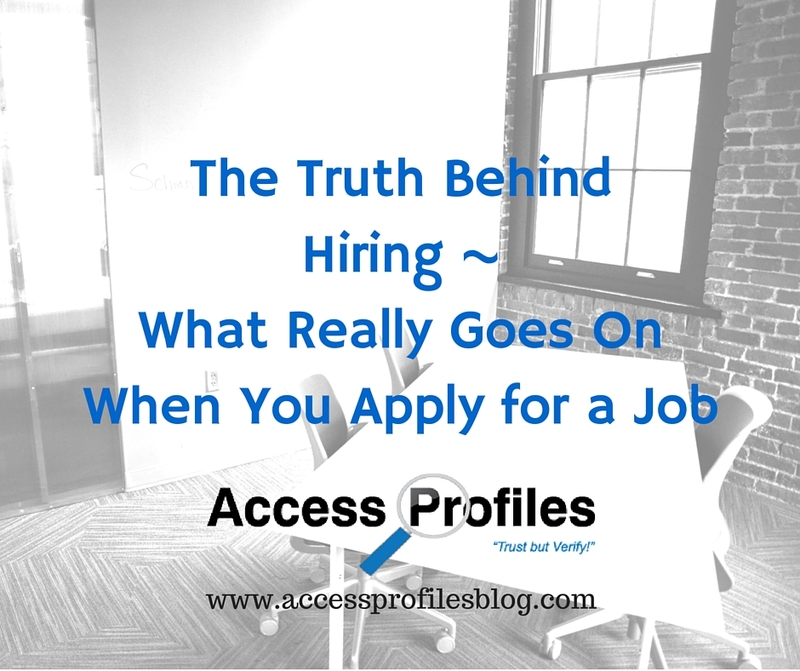 However, it is that person that will determine whether you proceed to further interviews. Be prepared to answer questions pertaining to your resume, skills, and problem solving abilities. Emphasize those that are essential to the job you are seeking. Have clear cut examples ready of actions you have taken that directly relate to what you can bring to the position. Share the results of those actions and what you have learned from them. Be sure to present yourself as the solution to their needs. You Get a “Conditional” Job Offer! After the interview phase, employers will decide which candidates will move on to the next step ~ the Conditional Offer of Employment. This means that you are offered the job pursuant to successful completion of the Employment Background Check. Depending on the position, companies may screen for criminal history, verification of education and employments, and even driving records. They are also looking for confirmation that what you listed in your resume is truthful. This can put many applicants in panic mode! What you need to remember here is that if you have gotten this far, the company WANTS to hire you! They are simply looking for confirmation that they have made the right choice. Read more in “Surprise! Doing a Background Check Means They Want to Hire You!”. Once Again, The Waiting Game! Even if all seems to go well, the hiring process can still drag on. This does not mean that the company found out something about you and is trying to find a way to let you down easily! Instead, the delay is most likely caused by something completely beyond your control. While usually the screening process runs smoothly, there are things that cause delays. This most commonly occurs when trying to verify education and employments. Often times the source is either unavailable or not responding in a timely manner. Find out more in “The Life of a Background Check”! Many times there is simply nothing that can be done to speed up the hiring process ~ as much as you would like it to be otherwise! So, even if they are completely sold on you, their own company policy dictates the steps they need to take. 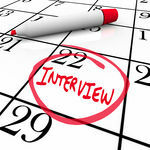 This could include a minimum number of candidates that must be interviewed for each position. It could even mean that there must be a certain number of decision makers that sign off on hiring you. No matter what the case may be, you have no choice but to be patient. If after a week or two you haven’t heard anything, you can reach out to your contact person and check on the progress. Anytime you can let them know you want the job, it is a good thing! And even if you are not offered the job, it is important that you don’t take it personally. While this will certainly be difficult to do, it is the only way you can save your sanity through your job search. All you can really do is keep going in your quest to find the job that is right for you! API can help You Get Your Resume “Background Check Ready” and even find out what is “out there” about you so you are not surprised! Contact API to Help You Land the Job! to get new articles focused on Hiring and Small Business delivered right to your inbox! Is your Small Business ready to handle the Holiday rush? Or is your business one of those that experiences a holiday “slow down” instead? Either way, there are steps you can take to prepare or weather whatever the holiday season brings! Planning ahead as much as possible is key. For example, if you are a product based small business, having enough inventory on hand to meet customer demand is important. And if you are a service business, knowing you have the time and manpower to fulfill all your client’s needs makes sense. In order to compete with “big business”, it is especially savvy for small businesses to have all their ducks in a row when it comes to their holiday promotions. Here you will find out both what you can do to plan for the holiday “rush” and what to do if this is your “slow” time! 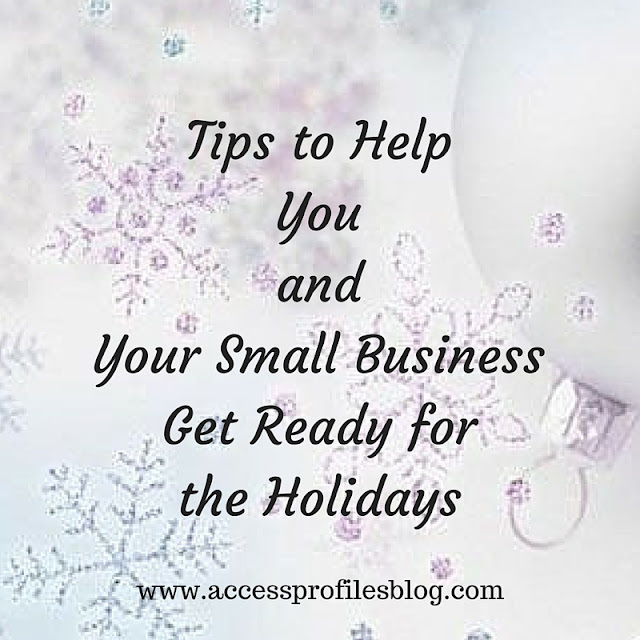 What You Should Do to Get Your Small Business “Holiday Ready” Tweet This! For many Small Businesses, the holiday season is the perfect time to reach new customers, strengthen the bond with existing customers, and increase sales. However, you need to keep in mind that planning is necessary so that your business can handle the increased demands. Suncorp also lists 5 holiday preparation tips. My favorite is the need to have “Festive Funds”. This means managing your finances in order to cover the increased stock or supplies you need over the holidays. Certainly makes sense! Hiring Seasonal Workers? Start Early! If you are in need of additional help for the Holidays, your best bet is to start early. Being proactive will give you the best pool of potential employees to pick from. It will also give you the time to screen and train them accordingly. This is particularly important as you will be pulled in many different directions during this hectic time. Knowing you have well trained and safe new employees is critical to your small business continuing to run smoothly. 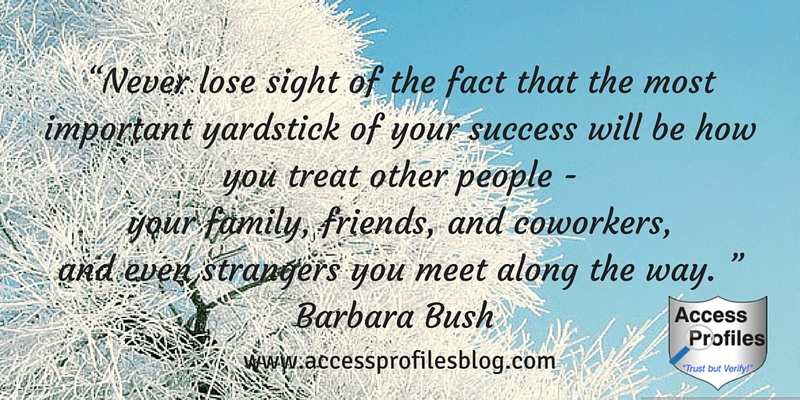 Find more tips here on “Making the Best Holiday Hires”! Get your Social Media Strategy Ready Now! Even if the holidays find you busier than ever, you can’t neglect your social media presence. You need to continue to post regularly. That includes your own blog articles along with sharing the relevant posts of others. However, the holidays are also a great time to get creative. Expand your holiday marketing to include some things you may not normally do. Jenn Herman of Jenn’s Trends shares 9 suggestions to get you started! My favorites .... “Ask Interactive Questions” and “Invite Photo Sharing”. Anytime I can do something to elevate my connection and strengthen my relationship with my readers, I AM IN! And of course Herman’s tip to “Support a Charity” is completely in line with my own belief in “Paying it Forward” and trying to “Make a Difference”! During the holiday rush, and the increased demands of running your Small Business, it is often easy to overlook those that are working hard to make your company a success. We may forget to recognize how essential our employees are in creating a productive and positive workplace. And while this should be an on-going effort on your part, a little special notice over the holidays make sense. It could be something small like a written note expressing your thanks (no emails here) or even a quick “thank you” to an individual or your whole team. You might also consider providing a work day meal or snack to help your employees recharge. Gifts like bonuses or gift cards are also great ideas. For something with more substance, nothing speaks louder than paid time off. If at all possible, doing this during the holiday season is a great way to reward your employees with more time to spend with family and friends. However, if this is not possible, then the promise of a break as soon as the season ends is best. 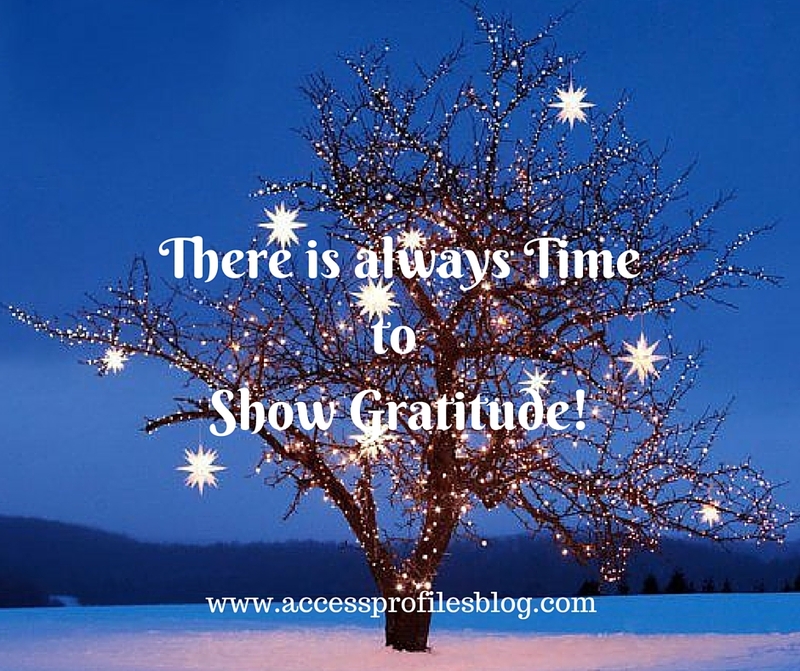 Remember, gestures of thanks can have a great impact ~ and are perfectly inline with spreading holiday good will! Stress can play havoc on your and your employees’ health and sanity. It can make you less able to focus, more susceptible to colds and headaches, and even impact your family and social life. And if your company is one that is in “commando mode” over the holidays, than this is even more true! The best way to avoid complete melt down is to Step Back. Many times the importance of downtime is either ignored, misunderstood, or thought to be impossible. Instead, we all need this time to give our minds and bodies the rest it needs. How can you achieve this when your small business is crazy busy? My favorite tip is to Incorporate Breaks into Your Work Schedule. Make it mandatory that you and your employees step away and take a break. A quick walk outside, a moment to close your eyes and sit back, and even an opportunity to get up and stretch can help. In the end, allowing you and your employees the chance to Step Back can make you all more productive and save your sanity! Find out more on how to feel less stress and stay healthier Here! What if you are one of those businesses where the holidays means less work, not more? My business is usually in a wind down mode when it comes to the holiday season. Many of my clients are not actively hiring and the need for my services lessens. And while I don’t stop work completely, there is a definite reduction in the time I need to spend on daily tasks. This works out perfectly for me as the holidays are my absolute favorite time of the year! I truly begin celebrating mid November, and and happy to continue well into January. I am unabashedly all-in when it comes to decorating, parties, and good food. So what can you do if your Small Business experiences the same lessened work load? To support my “holiday habit”, I pre-plan as much as possible (much like I do when taking a vacation). For example, I complete and invoice for any outstanding projects. I pre-schedule all my blog articles and social media posts (a tip that is essential whether the holidays are busy or your business experiences a down time). I also pay any bills that will be due during my break. While doing all this pre-planning and scheduling initially adds to my work, it is completely worth it to me to be able to enjoy the holidays. Discover more tips to help You take a break from Your Small Business Here! Handwritten cards, including a note of thanks (much like you should do for your employees) is a good start. If you are in the habit of also sending gifts, then be sure to order early! Offering year end discounts to your best clients is also a possibility (especially if your fees are going up next year). You may even consider inviting your local clients to lunch. Getting the chance to see them face to face is always a great idea. No matter what you choose, your clients need to know that you value them and their business! To end this year on a good note, taking a look at your finances makes sense. Start with consulting your tax preparer or financial adviser. Be sure you are up to date with all pertinent information. You can also organize receipts and start your year end totals. This will give you a jump start on tax season. If you have time, you can also begin to look forward to next year. This does NOT mean making business New Year resolutions! I believe in celebrating the holidays. I find myself too wrapped up in planning and enjoying them to really set business goals. (You can find out why and what I do instead here!). Instead, take some quiet time to celebrate your business. Focus on what you did right. Congratulate yourself and be satisfied that you worked hard this year. Hold off on looking at any mistakes you have made (and we have all made a few) until another time. This helps you end the year on a positive note! The holidays can be exciting, but they can also be busy and, sometimes, even frustrating. These tips can help you not only enjoy them, but come out of them a little less stressed and tired! Getting Your Small Business ready for the holidays starts now! Please Pay it Forward and Share this article with other Small Business owners! Thanks! Subscribe to our Blog Now for tips & information to help your Business Succeed! Contact Us and discover more About Us & our Hiring, Security Consulting, and Business Mentoring Services. Let us help You Hire the Best Employees for Your Business! Is Your Social Media Strategy Ready for the Holidays?